Ibiza Airport is a busy facility and this is especially the case at the weekends, when many clubgoers arrive from all over Europe for a weekend of partying at some of the island's legendary nightclubs. The busiest months see upwards of 500,000 passengers flying in and out of the island, onboard more than 5,000 flights. Many of the planes landing at Ibiza Airport are often painted in bright, colourful designs and offer superb views of the island when they come into land. The nearby capital is easy to reach via the highway named the Carretera del Aeropuerto / Circunvalación de Ibiza (E-20), which heads off in a north-easterly direction. Of note, principal airlines operating here include the likes of Air Berlin, British Airways, EasyJet, Iberia, Ryanair, Thomas Cook, Thomson Airways and Vueling, amongst others. 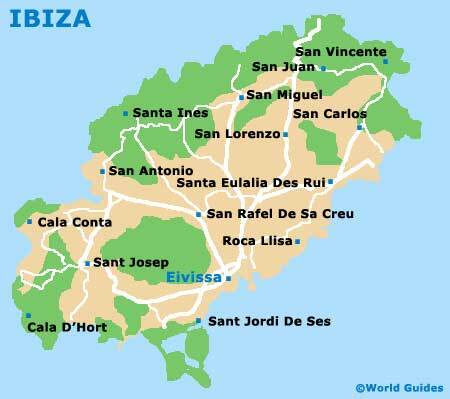 Ibiza Airport is situated just 7 km / 4.5 miles from Ibiza, the capital of the island. The airport is also 5 km / 3 miles from the San Jorge area. There is just one terminal here, which copes well with the large amount of traffic in the summer. 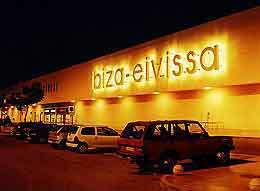 Ibiza Airport is located near to the Carretera del Aeropuerto road, close to San Jose, and is well signposted from most routes. Ibiza Town, the capital of the island, can be easily reached by car in around 20 minutes, depending on traffic, passing by the popular Playa d'en Bossa resort along the way. Taxis are also on hand, should you prefer not to drive yourself. Book your Ibiza Car Rental here. Regular bus services operate onsite and provide an inexpensive way to travel to the town centres and main resorts. Buses run from 07:00 to 22:35 and the journey time into Ibiza Town is about 30 minutes.